An investigation into the potential costs of a widespread mortgage princiapl reduction program discovered that taxpayers would benefit to the tune of $2.8 billion. The report, issued by the Congressional Budget Office, examined several scenarios and reported how different actions would affect taxpayers' bottom line. Principal: 1. The amount borrowed (such as the face value of a debt security), or the part of the amount borrowed which remains unpaid (excluding interest), here also called principal. 2. The part of a monthly payment that reduces the outstanding balance of a mortgage. 3. The original investment. The investigation was instigated by Rep. Elijah E. Cummings, a member of the House Committee on Oversight and Government Reform, when Cummings requested that congress should consider reducing principal for underwater mortgages backed by Fannie Mae and Freddie Mac. "Today’s report demonstrates that principal reduction programs are a win-win-win for our country — helping U.S. taxpayers, American homeowners and our nation’s economy all at the same time," said Cummings in a statement. He added, "Rather than implement these programs years ago when their benefits were obvious, ideologues ignored this evidence and harmed our nation as a result. I hope this report provides a new opportunity to anchor our nation’s housing policy in facts rather than partisan politics." Programs that reduced the principal --or amount borrowers owed on an underwater home --could reduce borrower defaults and provide a slight boost to economic growth, the Congressional Budget Office (CBO) discovered. The CBO considered scenarios that would bring homeowners to 115 percent, 100 percent and 90 percent loan-to-value ratios, calculating that as many as 95,000 homes could benefit from such a program. Principal reduction programs are opposed by Ed DeMarco, the current acting director of the Federal Housing Finance Agency. However, the announcement of President Obama's pick of Rep. Mel Watt, D-North Carolina, to replace DeMarco at the FHFA would precede a potential overhaul of FHFA programs and regulatory oversight. However, those in opposition to principal forgiveness say that the primary issue is the moral hazard of loan forgiveness. If taxpayers indeed pay to reduce loan balances for underwater homeowners, the door is open for homeowners to then sell their properties at a profit and pocket the proceeds. 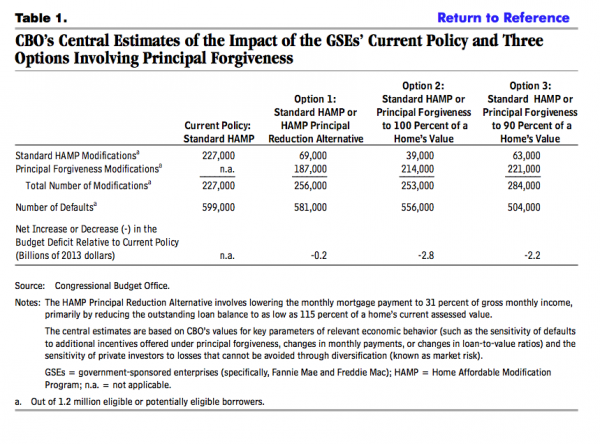 "The most effective approach would be to offer principal forgiveness only to borrowers who were delinquent at the time the program was announced, thereby excluding borrowers who become delinquent in order to receive principal forgiveness," the report states. "Another approach would be to forgive a portion of the borrower’s loan in exchange for granting the lender a claim on future equity or home appreciation — that approach is known as a 'shared appreciation' modification." Under one example included in the report, the lender could retain the right to 25% of any future increase in the home's value. Gretchen Wegrich is an editor at Lender411. She specializes in mortgage basics, personal finance and green living. She graduated with a bachelor's degree in writing from University of California, San Diego and previously worked at the Santa Cruz Sentinel. Contact her at gretchen@lender411com.